I haven't been able to do my Submit it Sundays due to my pc being down but I have regular access to a pc right now so I figured I'd put it up again! Link up your giveaways for all of us to enter! Jovan Satisfaction is so new that it’s not even on shelves yet! Available beginning February 1, 2010, Jovan Satisfaction retails for $12 for a 0.5 oz Eau de Toilette spray and $18 for a 1.0 oz Eau de Toilette spray at stores like Wal-Mart, Target and CVS, making this new fragrance a great (and affordable!) Valentine’s Day gift. One reader will win both a 0.5 oz bottle of both Jovan Satisfaction for Men and Jovan Satisfaction for Women (approx. value $24). This giveaway will end at noon on February 13th, 2010. Winner will be notified via email and announced in a new post here at A Simple Kinda Life. Winner will have 48 hours to respond to my email or they will forfeit their prize. Disclaimer: I was not compensated in any way for this post. I am simply posting this giveaway for the benefit of my readers. I received an email earlier this week from Heather over at _blank">Sweet Deals 4 Moms. She told me how she's helping Haiti by selling advertising to bloggers for a small $1 donation. Not only will this great idea help out the Bloggers who decide to take part in this great deal, but it will help the people of Haiti! Heather's matching .25 cents with 100% of the proceeds going to the Red Cross. Your button would stay on my sidebar until March 1. Read her post here for more details. You've seen my other UPrinting Giveaways, and I'm sure you see them all over the web as well! UPrinting is offering one winner 250 Stickers/Labels! UPrinting offers Custom Stickers and Label Printing to suit any of your needs! They're great quality too! I've gotten a poster by them before, as well as cards, and I've always been impressed! I hope you will be too, when you win these stickers! This giveaway will end on February 13, 2010 at noon EST. Winner will be announced here at A Simple Kinda Life and will be emailed. Winner will have 48 hours to respond to email or will forfeit their prize. Disclaimer: I did not receive compensation for this post. I am simply posting this giveaway as a member of the UPrinting Blog Sponsorship Program for my readers. Rite Aid is one of my favorite stores to save money. Between their sales and coupons, not to mention their Single Check Rebate program, I save A LOT of money! Get a $10 gift card when you spend $25 or get a $25 gift card when you spend $50 on select heart healthy products at Rite Aid. See below for a full list of qualifying items. Aleve 80 – 100 ct. or LiquidGels, 40 ct.
Alli Weight Loss Aid Starter Kit, 90 ct., Refill 120 ct.
All One A Day Vitamins (Active, Energy, Weight Smart, Cholesterol Plus, 50 Plus Advantage or Vitacraves, 50 ct. Men’s Women’s or Maximum Strength, 100 ct., Teen, 80 ct., 2 Powder 12 or 18 ct.
Bayer Heart Health Advantage, 40 ct.
Benefiber 48-62 Does, 60-100 ct., Packet, 28 ct.
Centrum Cardio, 60 ct., Centrum Silver Ultra or Centrum Silver Men’s or Women’s, 100 ct.
Citrucel Orange 30 ct., Sugar Free Powder, 16.9 oz., Caplets, 100 ct.
Colgate Total Advanced Whitening Toothpaste, 4 oz. Coricidin, 16-24 ct or 10 oz. Ecotrin Enteric Coated Aspirin, 81 mg 150 ct. or 325 mg 125 ct.
Metamucil 72 Dose or 100 ct.
Viactiv Calcium or Multi-Vitamin Chews, 60 ct.
*Receive gift card by mail. Purchases must be made 1/24/10 - 3/27/10. While supplies last. Limit one per household. Registration required. See Single Check Rebates Directory for details. 5 Minutes for Mom is one of my favorite mom-run blogs, and for good reason. Not only do they have great giveaways, but they help promote us smaller blogs, and they're such sweethearts! Right now, until February 19th, you can enter to win an XBox Elite Bundle from 5 Minutes for Mom! Caress has long been one of my favorite products. I used to love their beauty bars when I was a teen - the smell was scrumptious and it left my skin so soft! Then the body wash was introduced and I loved it even more than the beauty bars. In my older age, I will only use body wash. I don't know why, but I do! I was recently contacted by the Family Review Network to do a review of Caress Evenly Gorgeous body wash and beauty bar. The scent is different from the one I remember, but it's still a great scent! Caress Evenly Gorgeous is made with burnt brown sugar and karite butter, which gently exfoliates and moisturizes your skin to enhance its tone! Caress® makes skin the ultimate fashion statement with the introduction of the Caress Skinwear Collection®. Caress gives you gorgeous skin – right out of the shower – that you will want to flaunt just like the season’s hottest styles. Now you can shower on your look with Caress body washes and beauty bars for even toned, radiant or silky skin … and have the confidence to show it off! One of you will win a set of beauty bars that I reviewed above! Caress Evenly Gorgeous Giveaway http://bit.ly/aWfokd ends 2/4/10 @pricousins Pls RT! This giveaway is open to all US Residents and will close on February 12th at noon. Winner will be selected using Random.org and will be contacted via email, so please leave your email address or make sure your profile is public! Disclaimer: This post was written for Family Review Network as part of a program for Caress, who supplied the product for review. All opinions expressed in this post are 100% mine. Remember awhile back, when I posted about the ShopRite Bloggers in Caring program? Well, because of my efforts (and all of the other bloggers who participated! ), 3,000 boxes of cereal will be donated to local food banks in ShopRite’s trading area! I'm on the cereal box! You can't see it here because it's too small, but if you buy the box, and look closely, you'll see me there! The box will be on sale exclusively in ShopRite stores the week of January 24th so check it out if you like! I actually just came back from my local ShopRite and picked up a box for my friend - it was on sale for $2.50! ShopRite Partners In Caring, together with General Mills, has launched a video contest, Expressions of Hunger, that challenges everyday people to submit videos using song, poetry, dance or dramatic reading that creatively express the plight of the hungry or offer solutions to the issue of hunger. Up to six grand prize winners will have their stories and photos featured on a special-edition Cheerios box available exclusively at ShopRite stores in September 2010! The contest is open for submissions from January 1 through March 1, 2010. If you enter, good luck! Thanks to ShopRite and General Mills for letting me participate in this outreach program, and also thanks to everyone who commented on my post that helped donate a free box of cereal! Pampers has completely redesigned its Cruisers diapers with no sacrifice in performance. They are the brand’s 1st diaper for the best players in the world™ – babies! The new Pampers Cruisers with Dry Max helps lock wetness away up to 12 hours, making this their driest diaper ever. 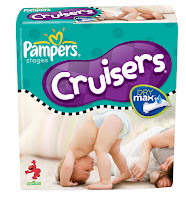 The new Pampers Cruisers with Dry Max officially hits shelves in March! For the first time ever, babies will have their gold-medal moment too this Olympic season by sporting their own high performance gear – Pampers Cruisers with Dry Max. To celebrate the launch of the brand’s first-ever high performance diaper, Pampers has outfitted Team USA athletes and their families, with branded Team USA Pampers Cruisers with Dry Max as they head to Vancouver for the Olympic Winter Games. Although these Team USA diapers are not for sale, starting tomorrow morning January 29th parents everywhere will be able to request a free sample three-pack of Pampers Cruisers with Dry Max on Pampers.com. If the sample sent includes a diaper stamped Team USA (randomly inserted in select sample packs), their baby will win a year’s supply of Pampers diapers! For many Olympic athletes, bringing home a medal is not just their dream – it’s their family dream. And as such, Pampers is working with two medal contender athletes – 2006 Olympic gold medal speed skater, Chad Hedrick and 2007 World Skeleton, Noelle Pikus-Pace - as they and their families prepare to “go for gold” at the 2010 Olympic games. Disclaimer: I did not receive compensation for this post. I am purely sharing this valuable information with my readers. Sunday 01/31/10 and can be saved/expire on 02/13/10. New to Cellfire coupons? Read my past posts on Cellfire here! Save $0.50 when you buy any Old El Paso(r) product. Treats, any size, any variety. Save $1.00 when purchasing Curel, 13oz or larger. General Mills recently announced that they were reducing sugar in kid's cereals to single digit grams of sugar per serving! That's HUGE! The company has already been reducing sugar in cereals while increasing key nutrients, such as calcium and vitamin D, and providing whole grain. We LOVE cereal and I do mean LOVE it! I'm happy that General MIlls is taking responsible steps to keep our kids healthier! Not only do my children love General Mills cereal, now I can feel better about giving it to them! Disclaimer: VIP coupons, online coupon link, and information have been provided by General Mills and MyBlogSpark. Stop by EBillMe.com to check out their MEGA Valentine's Contest - over $600 Value from Sears.com! All you have to do is tell them who your Valentine is! Things have been so crazy in my world recently. I wish I could get into specifics, but I really can't. Just know that I am here, trying to get giveaways and reviews posted, and I hope to have some of that accomplished between today and Sunday this week. All in all, I really just need you to pray for my children and I. I've seen tougher times and I'm sure we'll make it through but right now things are really rough for me! I've been seeing the new Neosporin Lip Health products in stores for a couple of months now, and I wanted to try them - but me being the frugal single momma that I am, I was waiting to try them when there was a really good sale that I could pair with coupon(s). Little did I know that Mom Central was going to be having a blog tour for a 3-day Challenge with the products! Needless to say, I'm definitely glad that I waited to try these products because I got to do a review for them! I received these products last week, Wednesday I think, and I began using them Thursday - the Lip Health Daily Hydration Therapy during the day, and the Lip Health Overnight Renewal Therapy at night. I've noticed a MAJOR difference in how my lips LOOK and FEEL and you can believe that I won't stop using the products just because the 3-day challenge has ended! My lips look healthier and feel healthier! And, the Lip Health products are SOOO creamy! And, the best part is the I don't have to keep reapplying the Daily Hydration Therapy over and over all day - I apply it two to three times and my lips are sufficiently moisturized! Be sure to stop by http://www.neolips.com/ to read more about the 3-day challenge, and to print a coupon! I wrote this review while participating in a blog tour campaign by Mom Central on behalf of Neosporin and received a sample of the Lip Health Overnight Renewal Therapy and the Lip Health Daily Hydration Therapy to facilitate my review and a $20 thank-you gift certificate. Recently, Mom Central presented me with an opportunity to try La Choy Creations. Now, I'm not a big Chinese food eater, but I do like the kits that you can buy and prepare you own Asian-inspired dishes at home. As you might know, my pickiness has rubbed off on my children, and I always have to worry about whether or not they will try the other types of foods I introduce to them. I was glad that I received the Sweet and Sour version, because I personally love anything Sweet and Sour, and most times when I get Chinese, I get Sweet and Sour shrimp. I also knew that this flavor would more than likely mean that my children would try it. I picked up some boneless chicken breasts from my local grocery store, brought them home and cut them up into 1-inch cubes, fried them with 2 TBS. of oil, and then added the ingredients from the box. The dish cooked quickly (in less than a half hour, which is very important to me!) and was very tasty! My children enjoyed it and so did I! If my pc wasn't dead, I'd share a photo, but you all already know that my pc died a couple of weeks back. La Choy combined all of the ingredients of a Chinese meal in one box – the only thing you have to do is add chicken, beef, shrimp, or whatever protein your family members enjoy. La Choy Creations include seasonings, sauces and rice –everything you need for a delicious dinner. When combined and tossed into the skillet, you can create a budget-conscious, home-cooked meal. And, best of all, a La Choy Creations meal can hit the table in about 20 minutes of kitchen time. La Choy Creations prove they're as easy to clean up as they are to prepare. With no additional ingredients to store and only one skillet needed to put it all together, La Choy Creations really offers a convenient option for an eat-in Chinese meal. These family-friendly dinners come in three varieties: Sweet & Sour Chicken, Teriyaki Chicken and Asian Fried Rice, none of which contain MSG! Be sure to visit the Recipes section on La Choy's website for some tasty dishes. You can also print a $1 off coupon while you're there! I wrote this review while participating in a blog campaign by Mom Central on behalf of La Choy and received a sample to facilitate my candid review. Mom Central sent me a gift card to thank me for taking the time to participate. Congratulations! I'm emailing you now! Please respond within 48 hours or I will have to choose another winner! Congratulations! I'm emailing you all now! Thanks to the sponsor for this review and giveaway! Wow - when I saw the newsletter for this week's 52 to Fabulous, was I blown away! This is exactly what I'm talking about! I can't do some of my assignment - which is to make a Vision Board, because I'm using my work computer, and you all know that I work on an Army base. I'll have to make my board, then take a pic and upload it at a friend's! Years ago, when I was in the homeless women's shelter, we had to write goals. When we first moved in, and then we'd have to revise them once we accomplished one or more. I was pretty good about this task - I always have had a pretty good idea of what I want out of life, even if I do get off-track a little bit. At one point, my counselor suggested that I make a timeline of sorts, that would basically be my life on paper. At first I was intimidated by this project, but she convinced me that this activity would be good for me and that it would help with some of the healing. By the time I was down with my timeline, I swear to you, it was about 8 feet long - no lie! I don't even have it anymore - it was in my file there but I really wish I had it now. I would add some things to it and have it to refer to and see how far I've come. It still amazes me, to this day! I guess what I'm saying here is that my timeline is very similar to a Vision Board, and I can't wait to do mine! I mentioned in my 52 to Fabulous week 2 post (What a Girl Needs) how I began to get healthier by eating soup for lunch and eating better instead of eating junk food and stuff that is bad for you and that I had already lost a little bit of weight. Well, we've been instructed to list a weekly goal, the barriers for this goal, how I will overcome that barrier, and then I just do it. Work out on the Wii at least 2 days this weekend plus next Monday and Tuesday. By telling the children that I HAVE to work out for at least 20 minutes on this day, etc., and we'll all have to work around that schedule. So far I've worked out on the Wii 3 days this week and although I'm sore, I feel good! And I can't wait to fit back into my old clothes! See you next week for the next #52toFab installment and Good luck with your transformation! You probably know by now that my computer at my house died. I've been crying about it all over the internet! My hard drive crashed, and although I have tons of parts to construct a new one until I can buy a new computer, it just hasn't happened yet. Because of this, I haven't been able to do too much on the computer. Right now I'm at work and usually blogs and other forms of social media are blocked but for some reason, for the past two weeks or so, they haven't been. So here I sit, on my lunch, eating my Progresso Light Italian Style Wedding Soup, YoPlus Yogurt, and a Ghiradelli Peanut Butter Square (or four! ), while blogging. 1 - I NEED to be a better mother. Years of mental issues, domestic violence, verbal abuse, and more have left me scarred. I really need to sit down and focus on what it takes for me to be a better mother. I took action on this this week by praying more and since I don't have a pc, I have been spending more time with the children. It's actually been nice to come home from work and just relax, even though I KNOW my inbox is filling up while I can't access it, it will still be there tomorrow. I have only a limited number of years left with my children and they are so important, and oh so worth it! 2 - I NEED to move. Seriously. My townhouse has two issues right now that my landlord seems to not care about. One has been almost a year old now. At this point, I'm praying about moving out of Maryland and if God says I should, then where? To the Seattle area, where my birth family is (and a support system! ), or to a warmer climate like Arizona or Georgia? My electric bills in my townhouse are also KILLING Me because of the age of the house and the fact that all of my appliances (including heat) are electric. It's running me broke! 3 - I NEED to get back to college. I talked about increasing my income in my last 52 to Fabulous post. To do this, I must go back to college and either work on a certification to work on computers, or I have to go work towards my degree. We also were told to take a look at our Week 1 list (What a Girl Wants) and take action on ONE WANT. The one I have taken action on is Getting healthier. Last week, I started working out on the Wii after work and I've been eating soups for lunch instead of going out to eat, or other nasty stuff. So far, I've lost a few pounds, so I'm happy so far! Look for my Week 3 post, which I'll be posting momentarily! Thanks for stopping by to read it! In an effort to do more personal blogging here, I have a story I want to share with you today. I am in no means a certified Microsoft Systems Engineer - but someday I hope to be. That being said, I'm pretty knowledgeable in alot of things on the computer. I could build a computer if I wanted to. In my last 3 jobs, in the last 9 years, I've often been called on for many computer-related tasks - running reports in databases, training personnel on a certain database, designing databases, to even more simple tasks like mapping network drives and printers. I enjoy computers and I always have. I can sit on the pc all day at work and then go home and still sit on the pc. I love computers and technology! Where I work I'm one of three women. The rest of them are men - all 42 of them. I'm often called upon for computer-related tasks here and it boggles my mind that people don't know some of the things you think they should if they're using a computer. I don't mean to be mean in this post so please don't take it this way but I'm going to share this story about someone that I work with. Very often, a certain person that I work with will call me back to his "office" to help him with something on the computer, whether it's opening an email, finding an email, or helping with training. Recently, we had a training course that everyone had to take, and this person in particular couldn't find the URL where to go back to the other training sessions, after he and his employees took one leg of the training. I went back to help him and I asked him to open Internet Explorer. He sat there. I pointed to the Internet Explorer icon on the desktop and said, "Click on this." Then I said, "Click in the address bar." More silence and confusion on the behalf of my co-worker. I pointed to the screen, to the address bar, and said, "Click there, in the address bar." I began to type the URL to the training. Now I think it's funny because I LIVE it quite often. And, I think if you were to see it, you would think it's funny too. Often times while helping this person, I'll say "Click there", and most people know it's a double-click, not just a CLICK, but not him. Or sometimes I'll even get a right click out of the deal. It's so funny to me that people who have computers at work don't really have a clue how to use one. I'm sorry I haven't been around to pick winners. My computer died last week and I'm unsure how long it will be down. I'll do what I can, when I can...Thank you for your patience. Last week, the Frito Lay Party in a Pinch Giveaway ended, and out of 164 entries, Random.org picked #98, who is cstironkat! Congratulations! The CheapCookieCutters.com Giveaway also ended last week, and Random.org picked #2 - who is pandorazbox1980! Congrats! Thanks to all of you for entering and please pray that I get a pc up and running at home! I'm having withdrawals!!!! You are probably like "HUH?! What is she talking about?!" I never got to go to Blissdom yet and this is the post that might help me get there this year! For 2010, to continue to follow my bliss, I want to grow this blog even further, but also head out to a couple of Blogging events, specificially Blissdom 2010, BlogHer 2010, and the Bloggy Boot Camp Conference through SiTS! I want to meet these new friends of mine and hang out with as many as possible! As for my personal life, the one you all don't see - I want to go back to college and start taking classes towards my degree. I'm stagnant in my job and I'm beginning to lose my mind. My goal in life is to work on computers, so ultimately that's what I will use my degree for, and that will ultimately lead me to my Ultimate Bliss. And, isn't that what we are all looking for? I found a contest that is essentially what my blog is about! Let me tell you about the Simplify My Life Sweepstakes , presented by the Mom Bloggers Club. 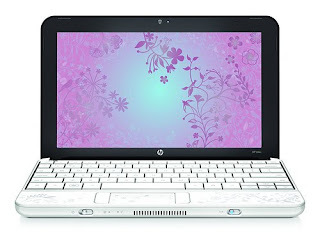 To win the beauty pictured below, an HP Mini 110 with Windows 7, by Studio Tord Boontje, I'm going to tell you how this gorgeous piece of machinery will help simplify my life. My life is hectic enough - I work full time as a secretary on an Army base, and I'm a single mom with a slim support system. I'm up at 4:30 am to be to work by 6:30 am, because sometimes I'll be behind the slowest driver in Maryland. (I swear!) I get home by 5:30 pm, and when I get home my day is not even close to being done! I have to help my children with homework, cook dinner, do laundry or whatever else needs to be done, then try to get on the computer to blog or talk to my friends on Twitter or Facebook. Sometimes I'm up way past my bedtime, which ideally should be 8 pm. I usually don't get there until 11 pm, and I spend alot of time tired! If I was to win this gorgeous, portable Mini, my life would change so dramatically! I could take it to work with me and be able to access the sites I can't access on the Army network (blogs mainly! ), during my lunch, and be more productive. I could Tweet and Facebook and play Mafia Wars all in the comfort of my nice warm bed instead of from that stationary desk in my living room. The best reason that I want to win this netbook is because my main computer died on me two days ago and I can't figure out what's wrong with it! I'M HAVING INTERNET WITHDRAWALS!!! I have to use the internet at work more than usual, and this might turn out badly! I'm all about the Simple Life and this HP Mini would help me be closer to that goal, by being able to network wherever I want, take online classes, and I might even share with the kiddos! If you want to try to win one of these computers, there are also 3 being given away to people who comment on the entrants' sweepstake posts! So comment away friends! I'm addicted to my computer, the internet, my blog, and YOU, my friends, so when I have a technical difficulty in which my computer doesn't like me, until I can figure out the problem, I go mad! Without the internet I feel disconnected and lost. That's what is wrong with me right now - two days ago my pc wouldn't load Windows so until I can figure out what's wrong with it, I can only use the pc at work or at a friend's (which I hate to do). I'll be getting my remaining reviews and giveaways up as soon as I can! 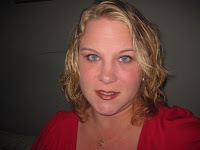 My friend Andrea from Moody Mama Says told me about this really cool "project" thing going on in the blogosphere. It's called 52 to Fabulous and you should definitely check it out! This is the first week for 52 to Fabulous, and the topic this week is "What a girl wants". I want to become more financially stable. I'm a single mom and although I've increase my income since 2001 about 400% (literally!) I don't get much outside support and Maryland is a very expensive place to live. It's up to me to provide my children's clothing, food, utilities, housing, medical costs, as well as incidentals - not to mention activities. I'd love to stop renting and have money in the bank. Because I'm a single mom handling all I covered above, I have no money saved up and if (God forbid) something was to happen, I wouldn't have any money to take care of it. I want to get healthier. This involves losing some weight as well as cutting down smoking, with a final goal of quitting. Both of these goals take time and perseverance as well as support, but I know that I can do it. I want more positive, lasting relationships in my life. I've had tons of friends in my lifetime, and for whatever reason, we've grown apart; but I honestly cannot say I have an "In Real Life" Best Friend. It's sad to say, but there's not one person that I could 100% of the time count on to be there, and that's sad. I'm looking forward to Week 2! Are you in? Yum! This is my second post about meat today! Can you say "drool"? Jimmy Dean is well known for their quality products. From sausage to bacon to easy heat and eat breakfast foods like their scrumptious sausage, egg, and cheese on a croissant, you'll find something to fit everyone's taste! My personal faves are the Sausage Croissants (hence the reason I mentioned them above), but I also love the roll sausage as well as the skillets, which are totally easy to make! I tend to avoid pork most times - I don't know exactly why but I've heard some not so fun things about it - but every once in a while I just HAVE TO HAVE some bacon or sausage for breakfast! And my kids like it too! They love it when I make them Sausage and Gravy - that's one of our absolute faves! One recipe I want to try, since I was contacted to do a review and giveaway of Jimmy Dean products, plus share some recipes with my readers, is the Breakfast Casserole - which is a recipe that my friend Diane has shared with me in the past - I've just never made it! Like cheese balls? Try this one: Jimmy Dean Sausage Cheese Balls. Or how about Sausage-Stuffed Acorn Squash, pictured above? Yum! Or maybe you'd rather try some Jimmy Dean Maple Sausage Corn Bread Pudding? Jimmy Dean recipes on the website! Just be prepared and wear a bib or carry a napkin, because you're going to be drooling! The products I got were two boxes of sandwiches (one of the sausage croissants mentioned above and one of the sausage, egg, and cheese biscuits) - let's just say I just bought the boxes on Thursday and they're already gone so I guess you can guess that they are TASTY! I also got a sausage roll, which I will use for the Breakfast Casserole I mentioned above. Three of you will win a coupon for a free Jimmy Dean product (up to $6.99)! *For extra entries, view my Giveaway Rules, updated 12/2/09. Fine print: This giveaway is open to US and Canadian residents and will end on January 18th, 2010 at noon EST.